1. After converging the column, go to the Internal Streams page on the Flowsheet tab of the Column Property View. Stream – Enter a name for the streamStage/Type – Enter the location you wish to take the stream from. For the feed to the reboiler, you will want the bottom tray liquid; for the feed to a condenser, you will want the top tray vapour.Net/Total – For bottom and top stage products you can usually select either option. “Net” represents the material flowing from the stage you have selected to the next stage; “Total” represents all of the material leaving the stage (such as draws, pumparounds, etc. )Export – By default, a copy of the stream is created in the column subflowsheet. To create another copy in the main flowsheet, check the Export box. 3. 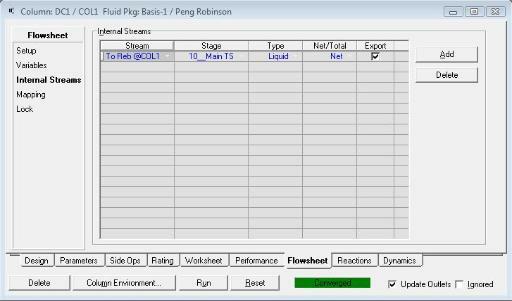 Run the column again, and find the newly created and solved stream in the main environment. 4. You can now create the heat exchanger, using the internal stream as the feed to the exchanger. We recommend adding a text box in the PFD indicating that there is an internal stream. Copy the temperature of the bottoms stream from the column to the product (in this case, we have called the product stream “2-phase”). Use a set operation to transfer the temperature. The advantage here is that as the column re-solves, the calculated temperature will also be transferred. While this example explored the possibility of using a rigorous heat exchanger model for the reboiler, note that there are many other possibilities. For example, instead of a simple condenser, the overhead condensing circuit could be modeled with an air cooler, accumulator and pump. We have provided our own preference here – but you may wish to further explore the other options. If you would like more information regarding the other options, feel free to contact us.